Car2Go uses a “free-floating” model of car sharing, where cars are available throughout the city and can be accessed “on-demand” or reserved up to 24 hours in advance. Car sharing in Vancouver has enjoyed rapid growth since its introduction in 2011, becoming earlier this year the first city of 29 around the world to reach 100,000 Car2go subscribers. “Many people are looking for mobility solutions,” says Smart brand head Annette Winkler, and the Car2Go sharing service is an example of how the Smart brand can provide them. “Smart wants to be more than a car,” she says. Other automakers are following. Toyota and ride-hailing company Uber have announced a partnership. General Motors has bought Lyft for its ride-sharing technology. Ford has bought software company Pivotal as part of its Smart Mobility initiative. Volkswagen has a new partner in Israeli-based taxi startup Gett. Vancouver, Canada’s third-largest city, illustrates how the auto industry’s growing commitment to mobility is being embraced. Residents here have taken to car sharing in huge numbers, giving a boost to Vancouver’s goal to become the world’s “greenest” city. Vancouver’s experience is instructive for the industry, as an explosion in ride-sharing services -- more correctly, short-term rentals -- makes car ownership unnecessary for many. In the city’s most recent transportation survey (2015), 26 per cent of Vancouver residents had a car-sharing membership, up from 20 per cent in 2014 and 13 per cent in 2013. Chris Iuvancigh, general manager of Daimler-owned Car2Go in Vancouver, says tight urban spaces and high real estate costs in the coastal city make ride-sharing services particularly attractive. Pricing and convenience explain why this transportation alternative has taken off in Vancouver after just five years. Car2Go offers one-way car sharing throughout this compact city of just 70 square kilometres, starting at 41 cents a/minute. 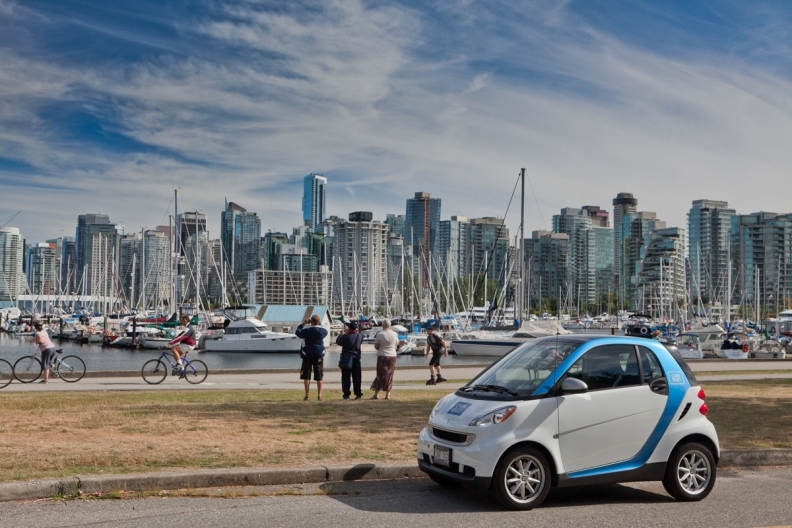 A network of 225 fuel-efficient, low-emission Smart “Car2Go edition” vehicles have been available to Vancouver Car2Go members since June 2011. Today's fleet numbers 1,000 cars. 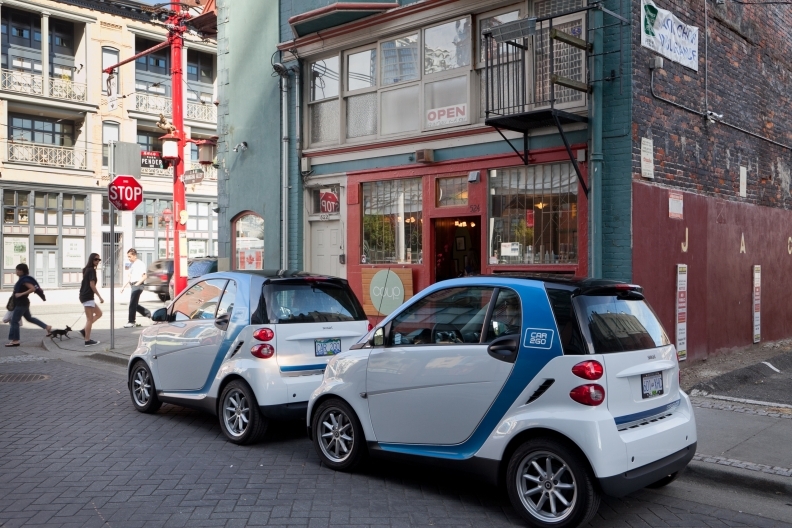 Currently, Car2Go has a fleet of 1,000 blue-and-white Smart ForTwo models in the city, and 110,000 registered members. 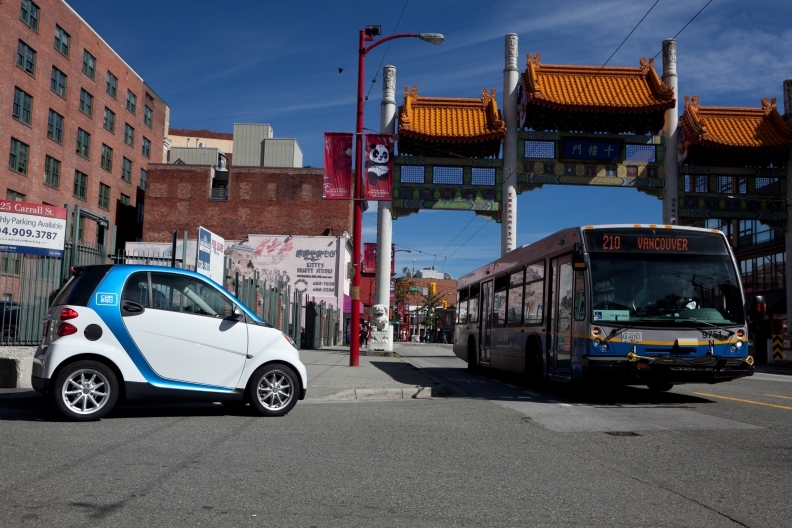 When Car2Go launched in Vancouver in 2011, there were 225 cars and 2,000 members. When Car2Go launched, Vancouver Mayor Gregor Robertson said the goal was to be “the greenest city in the world by 2020,” and that car-sharing is an important part of improving the city’s transportation system. Car-sharing is central to a mobility plan that has reduced the number of parking spaces in the city while dramatically increasing bike lanes. The Smart “Car2Go edition” vehicles, developed in collaboration by Car2Go and Smart in Germany, are the world's first series-produced automobiles designed and manufactured specifically for car sharing. Vancouver is not alone among global cities. Car2Go has expanded to 29 markets around the world. In total, the service now has 14,000–plus vehicles on the road, and 1.4 million members worldwide. It is not the only such service in town, though it is the biggest. Car sharing operators such as Evo, Modo and Zipcar have a minor presence. Car2Go blossomed with the backing of corporate parent Daimler AG. The Smart business plan dovetails with predictions about where new-vehicle sales are headed. Researcher IHS Automotive sees annual sales peaking at 100 million in the next decade, up from industry consultant LMC Automotive predicts will be global light-vehicle sales of 91.9 million in 2016. In an environment in which global vehicle sales are expected to slow and then peak, mobility solutions such as Car2Go’s successful operation in Vancouver offer the promise of incremental revenue growth.